As mentioned in my previous post I have used the time while waiting for feedback on Assignment 5 to finish off other projects. I received the feedback this morning but in the meantime had finished working on a rather special dress so thought I would write about this before responding to the feedback. This project started 3 years ago when I decided to bite the bullet and prepare an entry for the World of Wearable Art show in Wellington New Zealand. As well as having an interest in wearable art I also enjoy watching the behind the scenes extras included with major film productions such as Lord of the Rings. I decided to combine the two interests by making a costume that would be a “making of” in its own right, so the one costume would show the different stages of construction. Not settling for half measures, I decided to make my costume in very time consuming needle lace based on Venetian Gros Point lace with heavily padded edges. The plan was to have part of the dress finished, then the rest in different stages of completion so you could see the entire “making of” by looking at the dress. 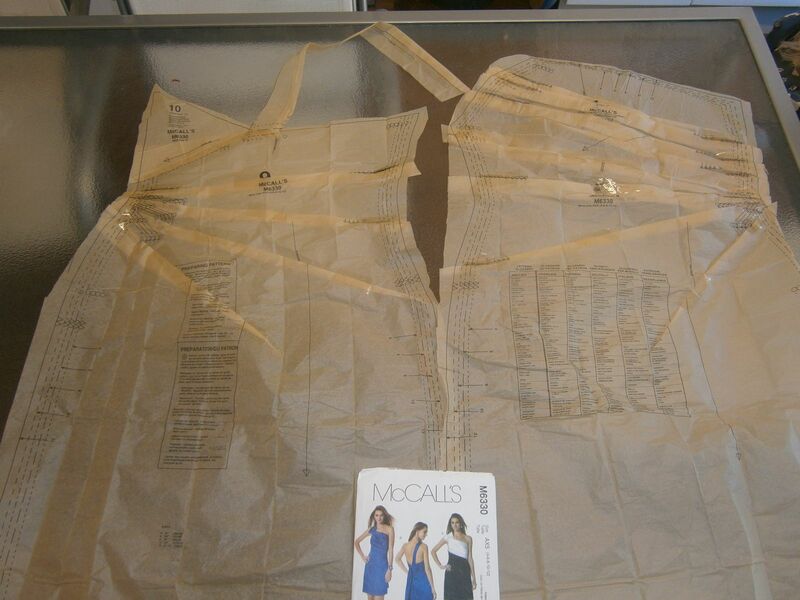 The first stage was to select a basic pattern to use as a template and I selected a McCalls pattern with an asymmetric line and a nice shape to the front. I cut out the pattern pieces and taped together the darts and pleats to form single pattern pieces for the front and back. Then I cut a single dart in each bodice and another on the hip line to simplify the shaping. 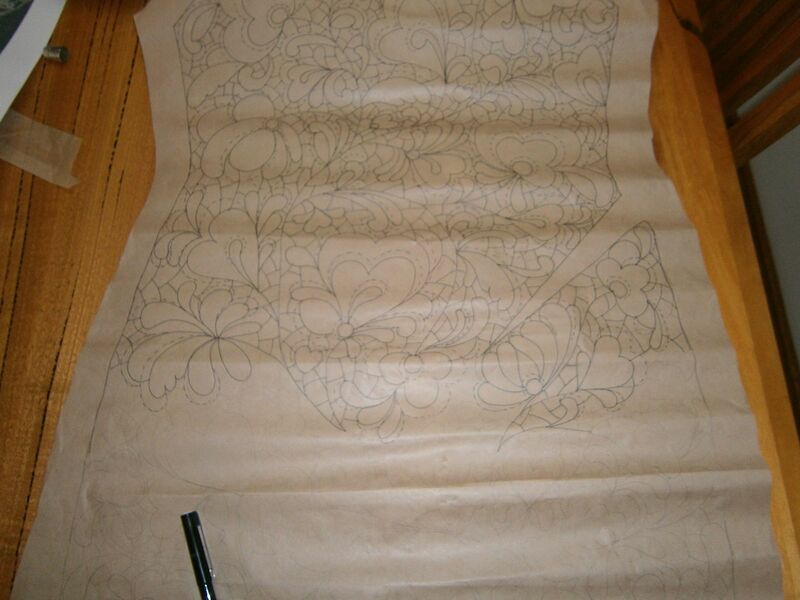 I transferred the outline of the pattern pieces on to brown paper and then started to pencil in my design. I designed a simple heart and flowers motif and drew 3 different size heart templates for continuity, then did the design freehand by drawing long sweeping curves down and across the pattern pieces and then branching off with the hearts and flowers. When I was happy with the design I inked it in. Next the brown paper was placed onto calico and large pieces of clear sticky backed plastic were placed on top. 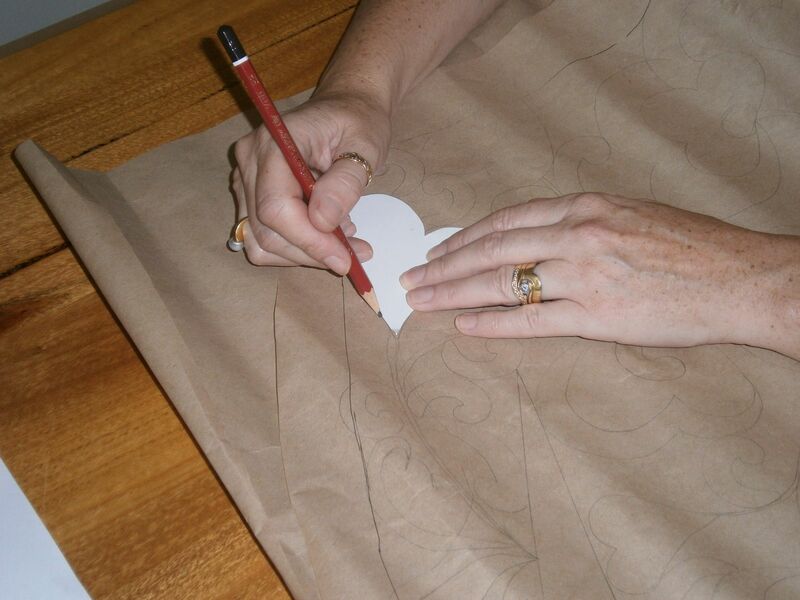 This provides a smooth surface for the needle to slide over when making the needle lace. 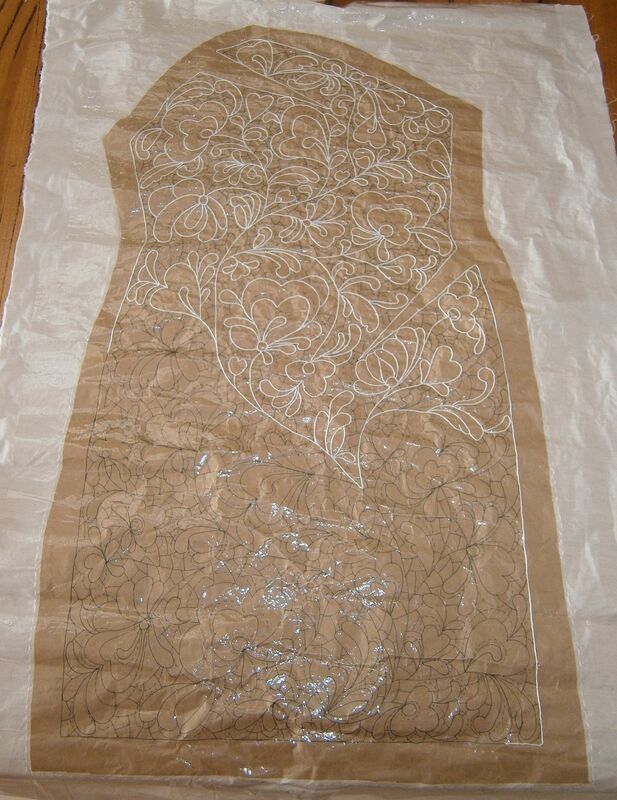 The outlining threads were couched into place over the main design lines. These are the only stitches that go through the layers of plastic, brown paper and calico. All other stitches are worked so they anchor onto these outlining threads but are not attached to the underneath layers. Now for the filling stitches. 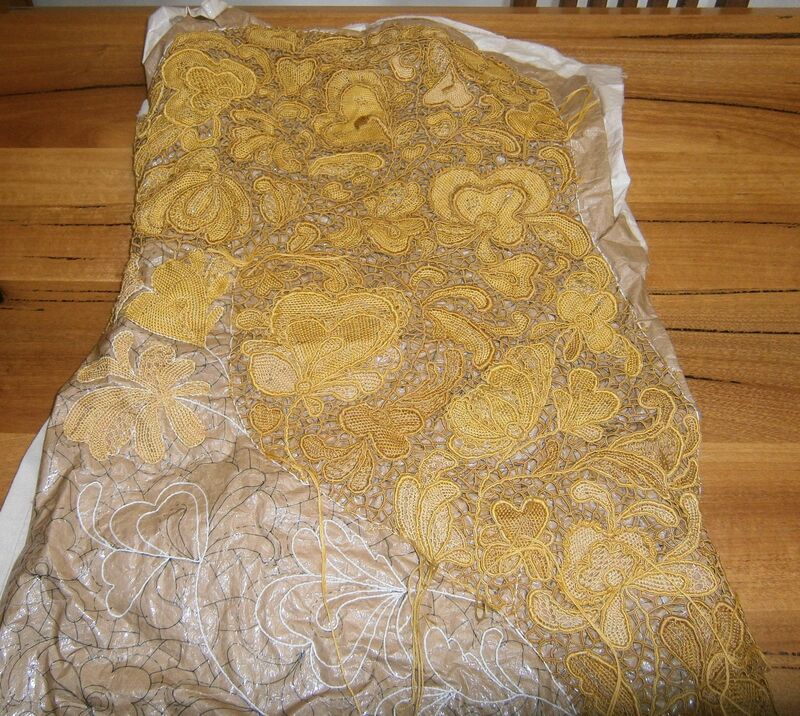 Stitched in Colour Streams Ophir thread in Umbrian Gold. In this next photo the colours of the thread appear very similar, but I soon found out when I ordered my next batch of thread just how different the colours were for the same named thread. I ended up buying 140 skeins from as many different suppliers as I could find in Australia, even asking them to deliberately send me threads from different batches so I had maximum variety. In this next photo you can see how the batches of thread differed greatly so I had to mix them up so as not to end up with big blocks of each colour variation. This photo also shows where I started adding the underneath layers of white padding (white yarn) around the edges of the shapes. Padding in Venetian Gros Point is a time consuming operation. Multiple strands of thread are laid over the base layer of white padding, and these threads are added in one at a time so the padding is shaped as it goes around a curve. You can see this clearly in the photo below that shows the padding increasing in width and height. As the covering buttonhole is stitched the individual strands that form the padding are carefully pulled through to hide the ends. After the highest/widest point of padding is reached the strands are then carefully cut out one by one to narrow the padding down again. 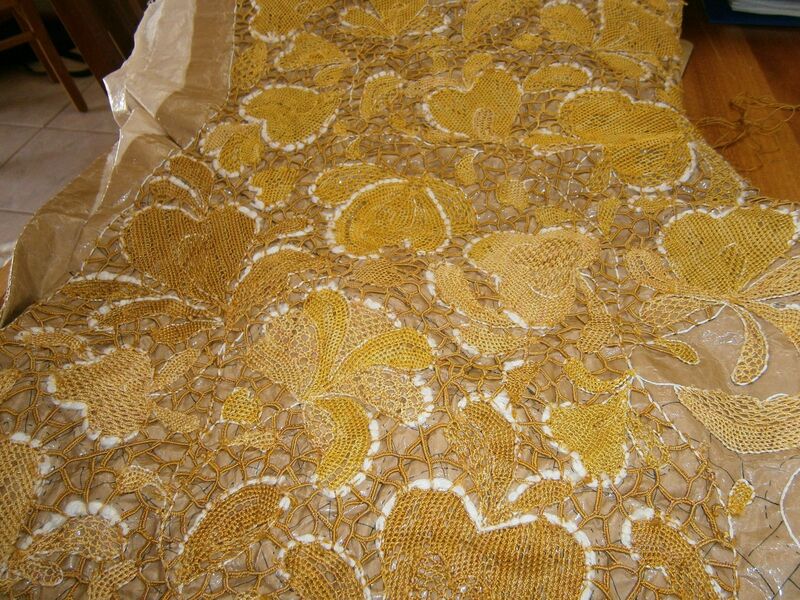 A section of the dress is shown below with some completed areas and some still being worked on. 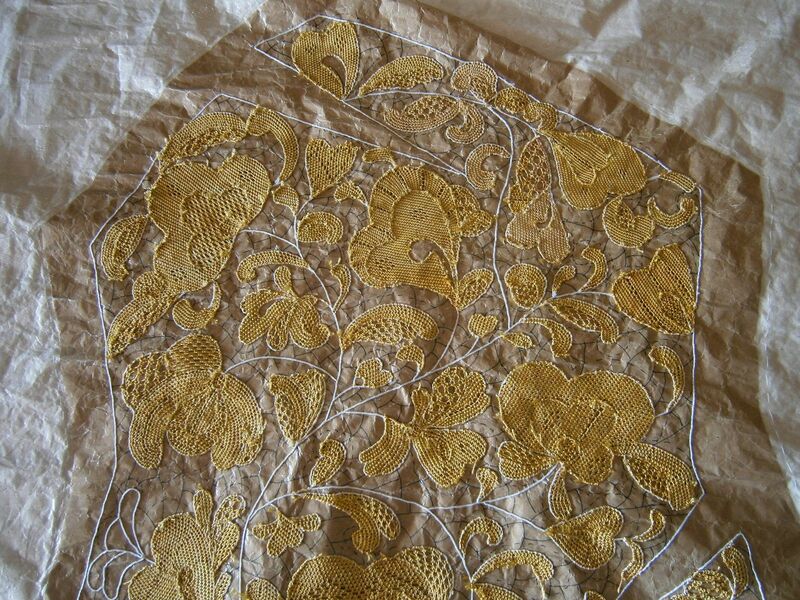 When the lace is finished, the couching stitches that hold down the original outlining threads are cut away by separating the brown paper from the calico. The lace is then lifted carefully off the top of the clear plastic. At the stage in the photo below, the lace has been partially removed from the backing leaving some areas still with the brown paper and partial stitching in place to achieve the “making of” effect desired. I made a black underlay for modesty. 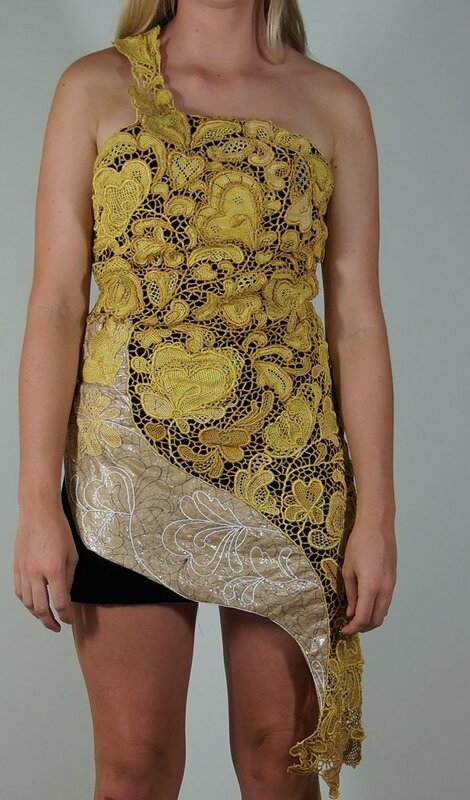 This is the dress as originally finished, designed to show how it was made. It wasn’t accepted into the World of Wearable Art which was not surprising. I do not think it had the impact to show on stage from a distance but needed close up inspection to be appreciated. For a show like WOW it helps to have a great silhouette and something that really stands out on the stage. So here I was with around 500 hours work and rather a lot of dollars spent and a lovely large piece of needle lace folded in a box. Move on a year and I decided that the lace simply had to be rescued and repurposed. I came up with the idea of making a full length evening dress for myself and using the lace as highlights. I chose a very classic black velvet and made a dress to a pattern called Anna from By Hand London, an independent sewing pattern design company. Then for the scary part – trying to envisage where the design elements of the original dress would fit on the new version and using a large pair of scissors to cut through the expanses of beautiful needlelace. And it worked! I very careful shaped the needle lace when cutting it to give me pieces that would curve across and down the bodice and length of the evening dress I had made. 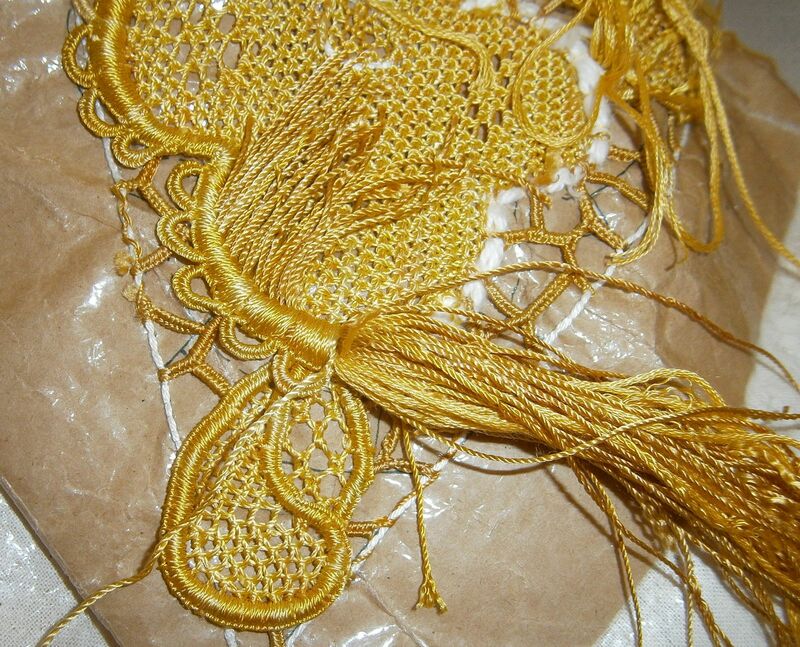 Then I had to stitch the needle lace on to the dress, trying to hide where I had cut ends of lace. At the back of the dress, I swept the needle lace so it would go across the zip. This is a loose flap of lace that is held in place by a simple press stud enabling it to be lifted up to reach the zip underneath. So after starting the original WOW version in 2012, the evening dress version was completed in August 2015. A very long time in the making and at one stage I really thought I would not end up with anything wearable but I am very pleased with the end result. One day I will make another attempt at an entry for WOW, giving more consideration to stage impact and having an amazing silhouette.